It’s been a while i’m not update this WebLog and here is it. The latest update of touge journey in one of the most cruel touge spot in Malaysia. Teluk Bahang, which located in north west of Penang Island which closed to Batu Ferringhi. The course is pretty extreme for outsider like me which can’t predict what is up ahead of the corner. How was is the corner geography and how to tackle it neatly. For sure i just hit the gas and turn the wheel “ikot Suke”. But i still to be fast on certain place, but the surface not allowed me to be crazy as i solo drive at Gombak – Sempah touge. With a good manner, i 50-50 surrender the the hill.. hahaha… ITS MY FIRST TIME BABE! There is two route for outsider visit Telok Bahang, which i used is the long way, from Tanjung Tokong, then touge a little bit at Batu Ferringhi then arrived at Dam. 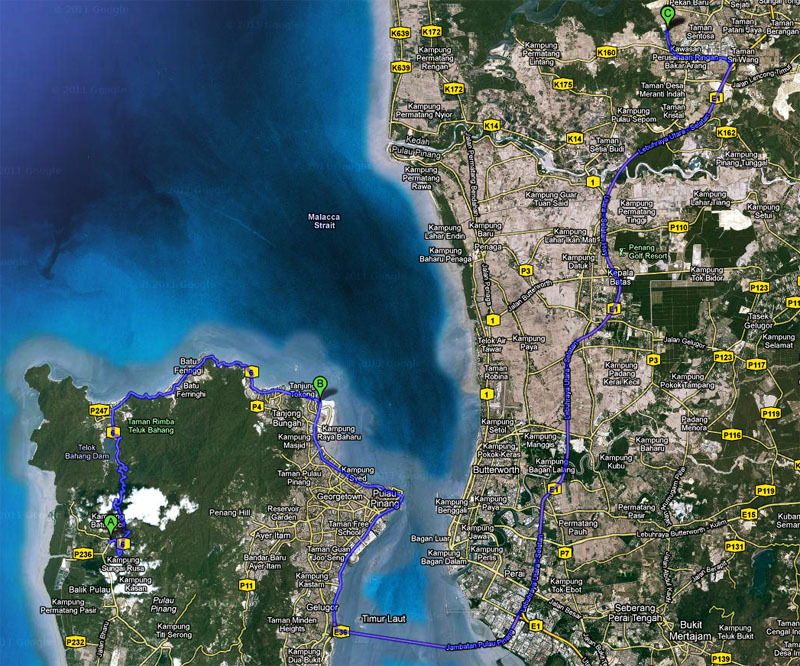 Other route is from Gelugor/Bayan Lepas to Jalan Tun Sardon then head up to Balik Pulau and reach Kg. Sg Pinang. You can choose which route you want to start first. Went to Sg.Petani, depart from KL at 9.15PM. Used old route, from Ulu Yam to Behrang and exit to Highway. Thought it will be fast route, but forgot.. ahh School Holiday has been started. Too many vehicle on the highway with rainy night. Very-bery slow moving from KL till Seberang Prai. Follow Cuz to andaman for his wedding suit etc + photoshoot. Eat Knduri then back rest and sleep for a while 5.30pm to 7pm. Take some video and photo shot while cruising on the Penang Bridge. Head-up to Teluk Bahang via Batu Ferringhi. Start hike-up a little and downhill about 400m, then a sharp right turn waiting me ahead. Then hike-up session start again and it’s continuous corner. At first start you will meet long sharp turn, then come very tight bridge. I try to throttle a bit more. Ahh.. under RPM 4, i’m deadmeat to hike the hill. A lot of risk corner in Teluk bahang. The road rhythm also not easy to handle. Need proper suspension system and proper tuned car to tackle this mount neatly. At 4:10am I switched on back handycam and turn it to recording mode. I move out at 4:11am. Try to challenge the hill my self. Vrroooommm! Still not fast.. hahaha! susah ke.. adehh =.=.. nnti aku tukar font!